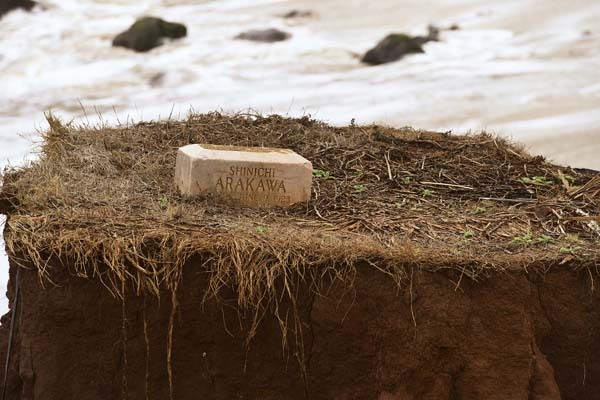 A fallen headstone (photo) lays in the shorebreak, while another sits precariously atop a small island (second photo) fronting the Paia Mantokuji Soto Zen Mission on Tuesday. Erosion along the shoreline threatens to claim even more graves, with several on the edge of toppling into the sea. 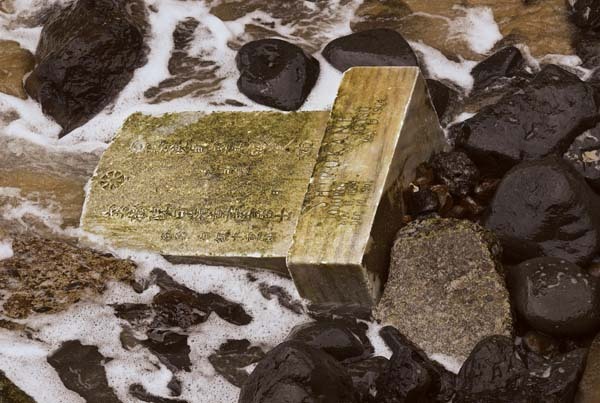 Members of the 111-year-old Mantokuji Soto Zen Mission of Paia are hoping to save their temple building and cemetery from rapidly increasing erosion that has swept out into the shore break close to a hundred gravestones and claimed several acres of land over the years. “The shoreline has been a threat, but just in the last three years the ocean has been really bad,” temple member Cathy Murayama said Tuesday. “It’s always slowly creeping up on us, but now we can see it 20 yards away from the kitchen, and maybe not even that. The temple established in 1906 is located across from the Paia Community Center and holds more than 600 grave markers in its cemetery along the coast of Mantokuji Bay. Climate change coupled with stronger surf has claimed at least 3 to 4 acres of the property. Temple and community members have recovered gravestones along the shoreline and piled them up in the middle of the cemetery. 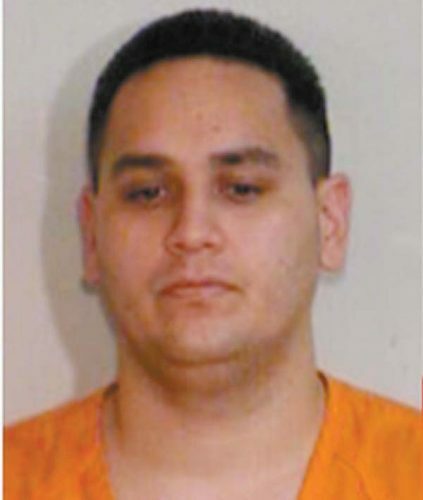 “It’s quite serious,” member Eric Moto said. “We’ve had to hire someone else to help us with the shoreline erosion (because) in the next decade it’s going to affect the temple structure itself if we don’t do anything. A planning consultant was hired last month to research viable solutions to protect the temple, cemetery and minister’s residence, Murayama said. Members did not know how long the process would take. Preventing further erosion and protection the temple will cost millions of dollars, she said. Moto, who serves as the president on the temple’s board, said that the iconic bell tower also is deteriorating due to termites and weather damage. The tower was built around 1912, when the congregation welcomed its iconic bronze bell from Japan. A contractor already has drawn up plans to restore and repair the tower “as close as we can to the original design,” which includes intricate carvings and wood pieces, Moto said. Four wooden pillars that hold the tower up will be reinforced. Upgrades to the tower will help protect the temple’s approximately 6-by-4-foot bell, which is one of the island’s biggest and oldest of its kind, Moto said. Murayama said that the Rev. Sokyo Ueoka, her grandfather, was sent over as a missionary and founded the temple to help immigrants. She said her grandfather, uncle and cousin served as the temple’s first three ministers. In its heyday, the temple had several hundred members, some of whom would ring the bell every day for more than 50 years, Murayama said. She said the bell was rung once early in the morning and again in the evening. Murayama also recalled playing on a WWII stone pillbox on the shore. It was swallowed up by the ocean less than 20 years ago. Murayama said membership has declined to about 150 members, some of whom are on Oahu and the Mainland. She is not sure how the congregation is going to come up with the money to prevent further erosion. Paia Mantokuji is the only Soto Zen Buddhist temple on Maui. Soto is the leading school of the sect and emphasizes meditation with no objects, anchors or content, according to “Soto Zen in Medieval Japan” by William Bodiford. For more information, contact the temple at 579-8051.